Summer may be nearly over, but here are five hot celebrity-inspired hairstyles you can rock from now through fall. Renowned stylist Mark Garrison breaks down five gorgeous looks and explains how to get the look at home. It’s a weird time of year — summer is nearly over and fall is yet to come. There’s no reason to kiss that carefree, easy-breezy summer attitude goodbye just yet! Here are five celebrity-inspired summer hairstyles you can easily rock from now through fall. The best part? No trip to the hair salon is required. Read on for NY-based stylist Mark Garrison’s savvy tips on fabulous and easy ways to achieve these looks at home. Vibrant color streaks were huge on the runways and now Hollywood starlets are flaunting the look, too. 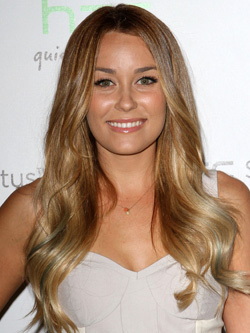 You can get the look with hair color and clip-on extensions. How? “Go into any local beauty supply store and ask for the semi-permanent color,” Garrison says. “Most stores will have a variety of brands and colors to choose from and they work better when the hair is lightened. Some brands like Manic Panic and Special Effects last a long time between washes.” Once you choose your desired color, you simply paint it on in sections. Want something less permanent than semi-permanent? Go with clip-on extensions. “You can find it in many colors, but beware that many are plastic and synthetic so putting too much heat will melt them,” Garrison says. Wavy hair was another big trend seen all over the Fall 2011 runways from designers like Tracy Reese and Tibi. Get the look in 15 minutes — while you’re sleeping. Here’s how it’s done. Start by spraying clean, wet hair with some hair spritz. Then, roll the hair into small individual buns held with bobby pins and go to sleep. When you wake up, “if your hair still isn’t dry, use a dryer on medium heat. Once this step is done, uncurl the buns and spray the hair with a hair spray and scrunch til you achieve to look you want or style into a chignon,” he says. Here’s how: “Start by sectioning the hair where you want the braid to be. Having the braid slightly damp will make the braid more solid and bold. Apply the gel to the braid section and begin. If you want a braid against the hairline, take small pieces along the hairline as the braid is forming, continue until you’ve reached the desired look,” Garrison notes, adding that if you’re really pinched for time, you can buy a pre-braided hair extension at beauty supply stores. A quintessentially-chic summer look that effortlessly travels into fall, Garrison says the trick to achieving a perfect pony is employing some easy stylist tips. “If you want a sleek pony, blow hair straight and then comb back with a flat brush and secure in place,” he says. Seeking something messier? “Just add texturizing mousse and scrunch a little bit or twist the strands in your fingers and hold for a few seconds. With your hands, pick up your hair and secure it with a simple hair band or clip,” he notes. Pin-straight hair is no longer de rigueur, so long-haired gals like Kate Beckinsale can sport a summery attitude straight into the fall and winter and look chic, too.